In a parade of government imprisonment, immaculate conception, religion, politics, cocktails and one articulate working girl, Heresy views the not-so-distant-future through the satiric and hilarious lens of A.R. Gurney. Just in time for the 2012 elections. Only at The Flea. A.R. 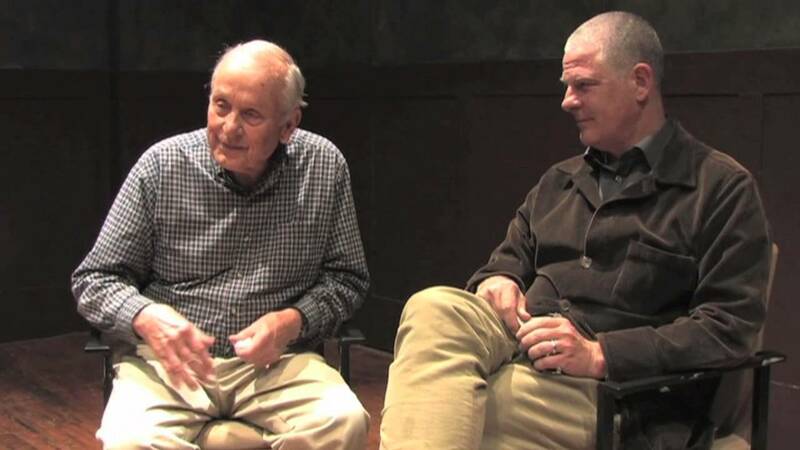 Gurney has been writing plays for over fifty years. Among them are: The Grand Manner, Scenes from American Life, The Dining Room, The Middle Ages, The Cocktail Hour, Love Letters, Sylvia, Far East, Ancestral Voices, Big Bill Indian Blood, Crazy Mary, and Buffalo Gal. At The Flea he has premiered Post Mortem, O Jerusalem, Screenplay, Mrs. Farnsworth, A Light Lunch and Office Hours. He has also written three novels, a few television scripts, several unproduced movies, and the librettos of two operas. 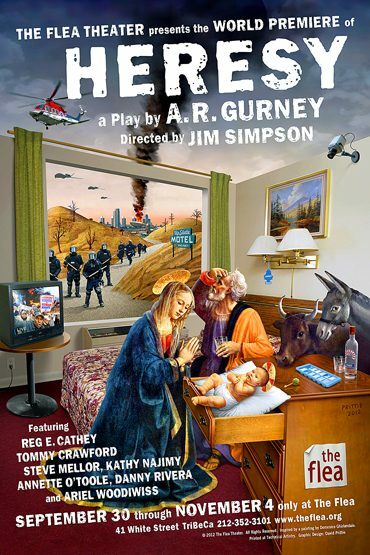 Gurney is a member of the Theatre Hall of Fame and the American Academy of Arts and Letters. He has honorary degrees from Williams College and Buffalo State University, and taught literature at M.I.T. for many years. Jim Simpson is the Founder and Artistic Director of The Flea Theater (2004 Drama Desk cited for Downtown Adventurous Theater). Two-time OBIE-award winner, 2002 National Board of Review Excellence in Filmmaking, and cited for artistic leadership in Downtown New York by the Lower Manhattan Cultural Council in 2002. Jim has directed over 70 works for the theater and has also directed for film and television. Venues include nine seasons at the Williamstown Theater Festival, Alley Theater, Hartford Stage, Yale Rep, Actor’s Theater of Louisville, Eisenhower Theater at the Kennedy Center, Lincoln Center, Playwrights Horizons, EST, CSC, MCC, the London International Theater Festival and the Melbourne Fringe Festival. Jim was a child actor in his hometown of Honolulu, as a teenager worked with Jerzy Grotowski in Poland, and holds degrees from Boston University School for the Arts and the Yale Drama School. Most recently, Jim directed A. R. Gurney’s Crazy Mary at Playwrights Horizons, Will Eno’s Oh, The Humanity…, the revival of Peter Handke’s Offending The Audience, Addison’s CATO, Thomas Bradshaw’s Dawn, Gurney’s A Light Lunch and Office Hours, Will Eno’s UNUM as part of The Flea’s The Great Recession, Jonathan Reynolds’ Girls in Trouble, Bathsheba Doran’s Parents’ Evening, and Steven Banks’ Looking at Christmas.